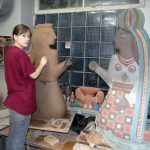 Lesia Horlova is a ceramicist whose works range from small figures to monumental sculptures. She also works on a potter?s wheel, paints, and works in the graphic arts. Since 1996, she has taken part in many exhibits and competitions, where she has received recognition and a scholarship. In 2005 she graduated, with distinction, from the Mykhailo Boychuk State Institute of Decorative and Applied Arts of Kyiv. She draws her inspiration largely from Ukrainian historical themes from the Scythian and Trypilian periods, attempting in her work to unite the traditional with the modern. Her works are to be found in museums and private collections in Ukraine as well as abroad.